Had to share this great find with you! I was shopping in Curry’s yesterday for journals to show at the networking event I am attending next Tuesday and on the way out I saw this bag and matching pencil-case. I decided to buy it because when I lug around all my art supplies and journal when I go out I am always struggling to keep it all together and not spill it all over the ground. Now I won’t have to worry because I will be comfortable and stylish too! That is always a good thing in my book. The bags are made by a company called Blue Q. They make the bags out of grain sacks and do a lot of recycling with their product line. They also have a witty irreverence in their branding which I can appreciate. I might have to get more. It was just so hard to pick one. 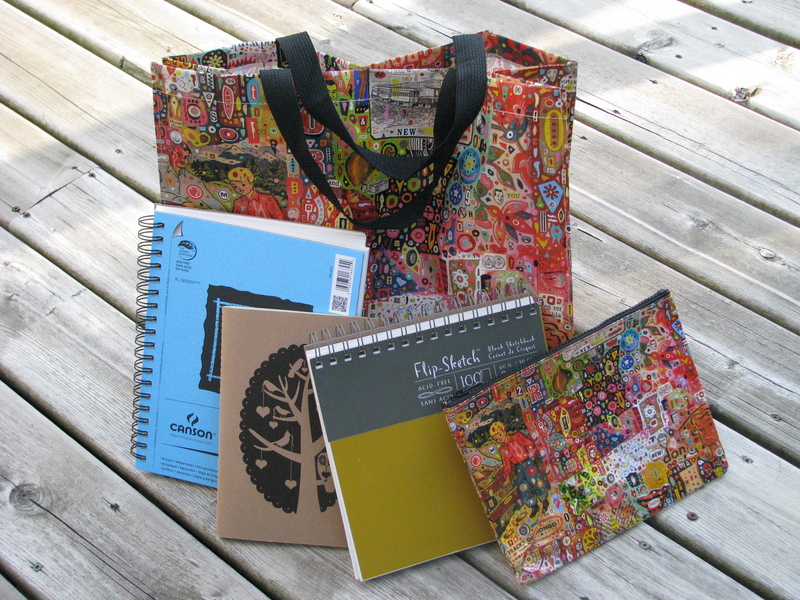 As for the networking event, I am planning to rent a table on Tuesday to showcase all my art journal paraphernalia. I am hoping to gather interest for the workshops I plan to run in September. I will keep you posted as to when they will be and how much they will cost. Gotta go pack the bag!! Next Rainbows are all around us!